For infants - age 5, our nursery is a fun and stimulating environment for bed babies through children 5 years old. 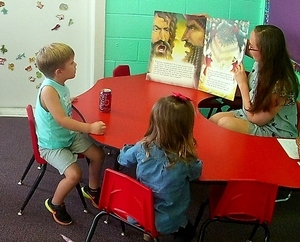 Children have the opportunity to play with a variety of toys, create cute crafts, and learn about the Bible through stories and base level activities. We strive to show the love of Christ to every child who enters our doors. This class is for children in grades K-1. 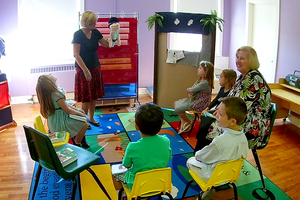 We engage these naturally curious learners through interactive activities such as developmentally appropriate Bible lessons, scripture memorization, Bible-based videos, puppetry and Science experiments that support God’s Word. 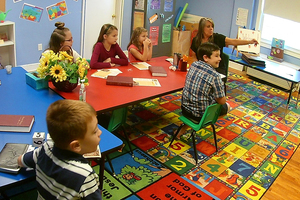 Our class offers a fun and friendly atmosphere for 2nd to 5th graders . Our early arrivers can enjoy a fellowship snack-time and "hands-on" activities such as books, puzzles, blocks and "make a joyful noise" musical instruments. For our Bible study time, we use the Bible Studies for Life literature and online ideas which offer fun lesson-related activities, games and crafts. We end our class time with a "friendship circle prayer" before attending the morning service with our families. Each Sunday morning, we strive to share and help the children to know and understand the gospel. Wednesday evenings are a special time at Smithwood. 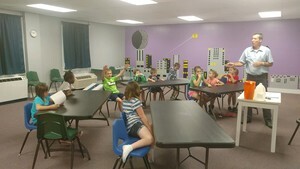 Children from kindergarten through fifth grade participate in JustLead, a discipleship program connected with the Emerald Youth Foundation. The evening begins with either choir or missions (which alternate), followed by a light supper. Students then participate in a group lesson and games, before ending the evening with a small group lesson. Singing is a natural expression for children. Learning songs of faith and praise at an early age helps establish a Biblical foundation. The promises of Jesus and knowledge of His love taught in children’s choir will carry with the child throughout his / her life. 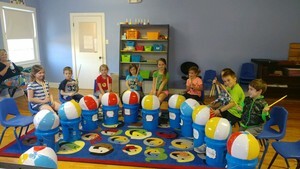 The use of classroom instruments helps teach rhythm skills. In addition to acquiring personal interest and skills in music the children experience a godly example of teamwork. We share with our church family during the Christmas and Easter seasons as well as other times during the year.